Each year, WTA publishes the world's only rankings of companies that operate teleports for commercial purposes, including independents, satellite carriers, fiber carriers and technology providers. Organizations that operate teleports principally for their own use, such as broadcast networks, are not included. Rankings are based on total revenue from all sources and on year-over-year growth. They recognize that, to some extent, every teleport operator competes in the same marketplace – the biggest with the smallest – but that like all marketplaces, the teleport sector has segments in which even the smallest players can compete effectively and achieve strong growth. The Global Top Operators - based on revenue from all sources and including all operators: from uplinkers to satellite carriers, fiber network operators to systems integrators, technology providers to specialized satcom service providers. The Independent Top Operators - based on revenue from all sources but excluding companies whose primary business is satellite fleet operations or terrestrial network services. The Fast Operators - based on year-over-year revenue growth in their most recent complete fiscal years, and including all operators. The Top Operators announcement receives press coverage within the industry and provides valuable exposure to the operators included in the rankings. The Top Operators rankings were first published in 2004 and were based on data submitted for WTA's Teleport Benchmarks project. The Benchmarks surveys provided data, analysis and insight into the commercial teleport sector worldwide, based on five years of data submitted by members. It is available free to WTA members and may be purchased by non-members. 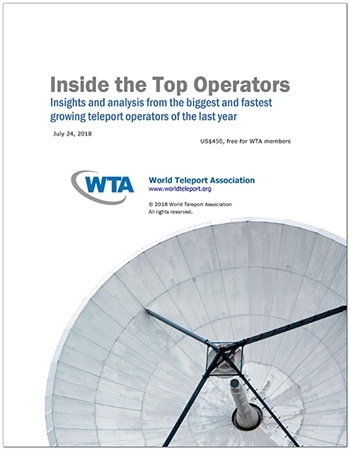 Find out what makes a Top Operator in WTA's report Inside the Top Operators. The report is available free to WTA members or for purchase by non-members. The Global Top Ten - including all commercial operators: independents, satellite carriers, fiber carriers and technology providers. The Independent Top Ten - excluding companies whose primary business is satellite fleet operations or terrestrial network services. The Fast Ten - based on year-over-year revenue growth in their most recent complete fiscal years.